Behind the unimaginative name is a park teeming with wildlife. Covering three islands and miles of ocean, this celebrated reserve protects reefs, rainforests and everything that inhabits these fragile ecosystems. Book yourself on a guided trip to the volcanoes and get up close and personal with traditional Samoan culture and local wildlife. Claimed to be one of the most beautiful in the South Pacific, Forbidden Bay is situated on the north coast, and can be reached from Fagasa on a trek or a boat trip. Its sandy shores are refreshingly uncommercial, so make sure you stock up with plenty of food, water and sun cream before you go. Dive in the Fagatele Bay National Marine Sanctuary, which was established to protect the corals reefs and marine life in the area. Diving equipment can be hired easily and a number of companies provide dive courses and cruises to the best sites in the area. 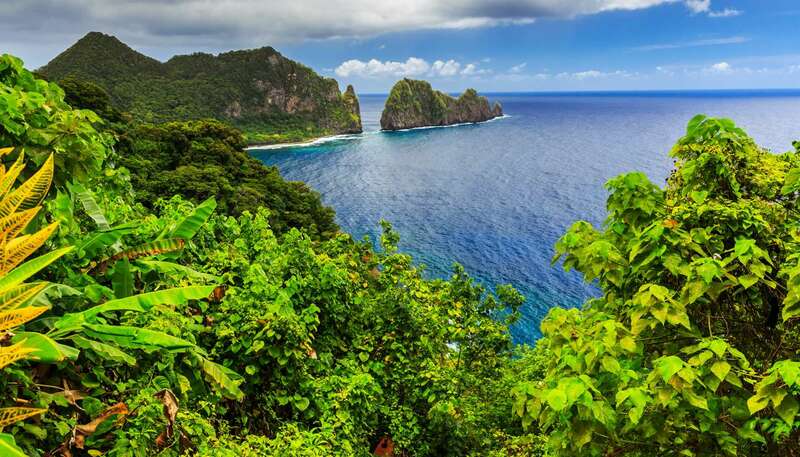 Tear yourself away from American Samoa's beaches and head to the rocky cliffs of Vaitogi, where one of the archipelago's most famous legends was born. We won't spoil the story of the Turtle and Shark, but local guides will be only too happy to regale you. Ta'u Island is considered the birthplace of the Polynesian people and therefore recognised as a sacred site. Geographically speaking the island is ensconced in the remnants of a volcano. Thankfully the last known eruption was in 1866. From the highest point on the island you can spy Upolu in neighbouring Samoa, which is sometimes visible. It's relatively simple to travel by boat to Samoa and stay overnight in a local Fale (a Samoan house made from coconut palm fronds). Getting by is also a doddle, as the official languages are English and Samoan, which is also spoken in American Samoa. Go game fishing for marlin, yellowfin tuna, wahoo and skip jack. Fully-equipped fishing boats can be hired through hotels or tour operators. Perfect for beginners or more experienced anglers, the waters around American Samoa have long been cherished for its plentiful fish and crystal-clear clarity. Situated at the far end of the eastern district of Tutuila, Tula Village overlooks a coastline of white sandy beaches and reefs that are exposed at low tide. The area is believed to have been the first settlement on the island, with its residents travelling from Fiji and Indonesia around 600 BC. Don't miss the harbour of Pago Pago, made famous by Somerset Maugham's short story, Rain. The town itself is a hub for semi-urban communities, tuna canneries and provides employment for a third of the population of the island of Tutuila. Interestingly, the area is actually the crater of an extinct volcano. Experience the legendary Samoan feast where food and entertainment go hand in hand. Suckling pig, chicken and fish, breadfruit, coconuts and mango are served during performances of traditional dancing. The term fia fia translates into many meanings such as "happy", "celebration" or "get-together". Rest assured, a good time will be had.